Known as "Pascuas" christmas in Spain is a somewhat drawn out affair covering between the 24th of December up to the 6th of January. As in every country around the world each family celebrates the christmas holidays in a slightly different way and as such strictly speaking there is no "typical Spanish Christmas" but instead certain families choose to observe various traditions or not. This page attempts to explain the different aspects and traditions of christmas in Spain although don't be surprised if some a Spaniard says "we don't do that" the next Spaniard you meet will probably say "Yes, we've always done that"! In almost every Spanish city an area is given over to stalls with selling christmas goods, for exmaple in Madrid the historic Plaza Mayor is used from the last week of November. 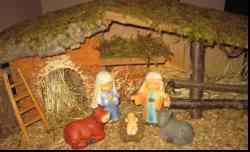 The porduct range covers nativity figurines / scenes, decorations, trees and costumes. It is also at this time that hot roast chestnut stalls appear in popular zones of the cities. The Spanish christmas tradition of building a navity scene is one shared with other countries however the Spanish version can be considered as far more elaborate than those that the family gathers round for an afternoon and builds from cardboard and double sided sticky tape! In the Spanish nativity highly detailed figurines (which can cost anything from 5€ to 100€ each) are placed inside a wooden manger covered in fresh moss and accompanied by any number of "add ons" which can include working streams, fountains and even representations of torches for lighting. For many families the "Belen" as it is known is something to which you add one or two pieces each year depending on your economic means. Chistmas in Spain is not Xmas without "El gordo" or "The fat one", this is a lottery in Spain that has converted into a christmas tradition. With the biggest prize pool in the world and a multitube of ways to win and participate visitors to Spain at christmas will be confronted by queues in the street outside the official outlets. A far more detailed description of prizes and the traditions surrounding can be found here: El Gordo. From the first week of Decemeber until the first week of January the price of seafood and fish doubles or even triples. Whilst it was, and to some extent still, traditional to consume large quantities of seafood during the holidays this practice has been curtailed in recent years due to the high price increases. Known as a "cesta", which means basket but is more ofen than not a cardboard box, these hampers are traditional given out by companies to their employees. Depending on the company results the items contained within the hamper can vary from whole legs of Jamon to a Spanish Chorizo sausage. One constant however is a minimum of a bottle each of red and white wine! In the last few years various "ayuntamientos" or town councils have started to distribute small versions of these hampers to pensioners in their community, naturally free of charge! A nice touch to ensure the older generations continue to enjoy christmas in Spain! In common with many European neighbours Spanish villages, towns and cities all adorne their streets with lights and decorations from mid November onwards. The UK / USA tradition of "switching on the lights" is not really observed for christmas in Spain. Christmas in Spain centers around two days the 24th and 25th of December. With the night of the 24th being the more important of the two and known as "Noche buena" roughly translated as "The good night". This is not to be confused with "Noche Vieja" or "Old night" which is the 31st December. It is important to remember that different Spanish cities and regions have some distinct additional celebrations during the 24th and 25th and these are not detailed here. With almost all companies closing at midday on the 24th the roads in Spain become heavily congested during the afternoon as families return to their villages or towns to pass the night with their extended families. The Spanish authorities in major cities such as Barcelona, Madrid and Seville mount "Operación Salida" or operation getaway just to deal with the strain that these displacements put on the highway and transport infrastructure. It is commonly recognised as the busiest day of the year in terms of vehicle movements. Once reunited with their families the night of the 24th sees a formal set down meal in many households comprising of three or four courses and generally of the highest possible quality available. As mentioned earlier this was traditionally predominantly seafood but nowadays roast suckling pig or lamb is more commonly encountered. In the greatest of Spanish traditions this is all "washed down" with copious amounts of alcoholic beverages. Depending on ech family this can also be the night on which Children (and adults) open none, some or all of their presents. Strictly speaking presents should be exchanged on the 6th of January but this is now being disregarded with the majority of presents opened on the 24th and an additional gift being opened on the 6th. Similar to some other countries the evening of the 24th at 2100 sees the King of Spain address the nation with a christmas message which focuses on the years developements, wishes for the future and a general salutation for a happy christmas all round. Most families (whatever their perception of the Monarchy) will still sit down and watch the complete speech. Visitors to Spain during christmas should be aware that the evening of the 24th of December will see 99% of shops, restaurants and bars being closed. Depending on the excesses of the night before and the degree of faith the Catholic morning prayer service is something many attend before visiting the bars at midday. The bar in Spain is a community focal point and it is very much considered to be normal that babies, children and the family en mass go to the bar before lunch. Of course the younger crowd will spend the whole day within the bar but for families the midday meal on the 25th December is a semi obligatory affair where again copious amounts of food and drink are consumed. It is typical that each village, town or city has a number of public events programmed for the afternoon and evening of the 25th of December and even shops open on this day. Visitors spending the 25th in Spain should contact the tourist information of their destination for the precise list of events taking place as this changes every year. Reyes refers to Kings day (Rey = King) and is based upon the nativity story where the 3 kings arrive bearing gifts for the baby Jesus. In the catholic church this is believed to have happened a good week or so after the birth and the 6th of January has been decread as the day of the kings arrival. This at least is the logic behind the Spanish tradition of giving christmas presents on the 6th of January instead of the 24/25th December. In Spain children are told to leave a pair of shoes outside on the balcony so that the kings know the house is occupied and to leave gifts. The logistics being that the parents will put a small gift inside the shoe and the remainder in the living room whilst the kids are asleep. A concept most parents will be familiar with! Whatever the location of the presents the morning of the 6th is spent opening presents and mid morning will see kids pouring out onto the streets to play with and compare their new toys. Just as well considering that the parents are "back in the kitchen". Midday on the 6th sees the average Spanish family sit down for a formal Spanish lunch with, in many cases, the extended family gathered round. Whilst normally not as extensive as the christmas fare the menu is normal about quality rather than quantity, probably something to do with the effects of the xmas excesses begining to be felt! One indulgence however is the traditional "Roscon de reyes" which is a large circular donought shaped baked pastry/cake that is sliced open and filled with cream. Added to the Roscon before the baking stage are two small suprises: a gift and a large runner bean. 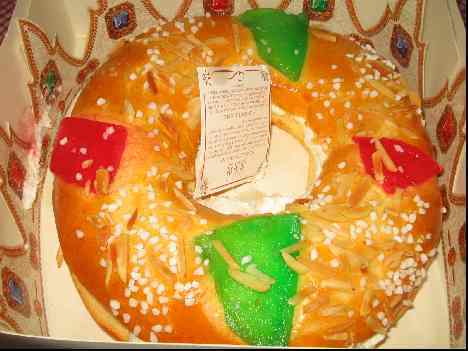 The Spanish tradition is that he who encounters the gift will have good luck whilst he who encounters the bean has to pay for the Roscon!! !